Kenya have sprung a surprise by leaving marathon world record holder Patrick Makau out of their 2012 Olympic squad. The African nation's abundance of talent means 2011 New York and Boston marathon winner Geoffrey Mutai and Emmamuel Mutai, who won in London last year, are also missing. But Kenya are still confident of winning gold at the games. They named Sunday's London Marathon winner Wilson Kipsang and double world champion Abel Kirui in their squad. Moses Mosop's third place in the Rotterdam marathon earlier this month also secured his place in the Kenyan line-up. 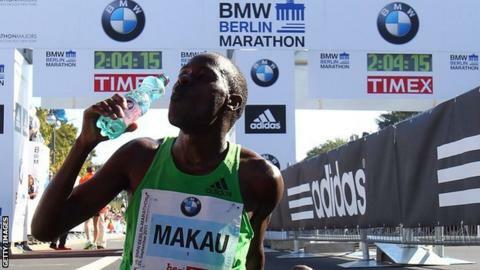 Makau set his world record of 2:03:38 in Berlin last September, with Kipsang setting the second fastest time ever run when registering 2:03:42 a month later. Kenya have selected the first three women home in the London Marathon to represent them in the Olympics. Double London champion Mary Keitany, world champion Edna Kiplagat and world silver medallist Priscah Jeptoo will compete in London this summer.